Singapore: Orders are processed and delivered in approximately 2 business days . We also offer the options of next day delivery (orders must be placed before 5pm) , and even same day delivery (orders must be placed before 4pm) across Singapore. All our gifts are packed and deliver in “MyBabyGift” signature box, tied with satin ribbon. In order to personalize your gift with our special embroidery, our delivery time is 2 working days. PLEASE NOTE – MyBabyGift hampers are usually delivered on business days. If you need urgent delivery on Sunday please give us a call +65 98339818/ +65 98333102 and we’ll do our best to find you a solution. We do our best to deliver your personalized hampers promptly, Therefor- if your hamper is ready before- we will send it before. You can always give us a call to ask how fast your hamper can be delivered. and a delivery fee of S$14.00 applies. Yes – we can do it for you! Orders must be placed bef ore 4pm, and delivery fee of S$20 applies. Isn’t it great for the new parents to receive the stunning baby hamper straight to hospital? We can do it! Please provide full details including name of hospital, building name/number, ward and room number – and ensure the recipient will be there on the scheduled delivery time. A S$10 re-delivery fee will be charged if mummy has left hospital or is under another name. 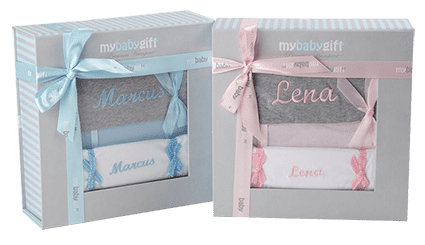 We know that a quick delivery is important and we do our best to ensure your personalized baby gift arrives to its destination as soon as possible. Unfortunately there may be delivery delays beyond our control- We are outsourcing our deliveries with external company and we depend on their delivery volume every day. From time to time, mostly during weekends and around the holidays, due to high volume of deliveries- your delivery can be delayed. In addition, from time to time, certain items are out of stock. In this case the item will be replaced with a carefully selected similar product, of equal quality and value. In the highly unlikely event that your gift is not received, or arrived damaged, please contact us as soon as possible. If you wish to cancel your order we can offer a full refund, on the condition that your gift has not already been embroidered and/or dispatched. All refunds will be made within 72 hours to your PayPal account. International deliveryFor Other countries- Please call us +65 98339818 to confirm delivery costs and estimated delivery times. We will send your beautiful gift hamper worldwide by Singapore Post. You may choose to send it by International Express 2-4 business days or by Standard International 3-14 business days – all costs must be confirmed with our team before placing the order. There may be costums chrges- MyBabyGift is not responsible for any customs charges or delays. Failed deliveryIf no one is home at the time of your scheduled delivery, we will leave a calling card with instructions on how to arrange an alternative delivery time. A S$6 re-delivery charge will apply. Incorrect address – a S$10 re-delivery fee will apply. If you wish to cancel your order we can offer a full refund, on the condition that your gift has not been embroidered and/or dispatched. Gift Sets in which one item or more have been personalized with baby’s name are not eligible for refund under any circumstances. All eligible refunds will be made within 72 hours. Every product is carefully inspected before it is sent. If any of the products you ordered arrives damaged or defected, please retain all packaging materials and at info@mybabygift.com.sg immediately. All claims must be made within days from delivery. Damaged items may be returned in original, unused condition and in original packaging were relevant, in exchange of a new identical item or a full refund. All eligible refunds will be made within 72 hours. Contact us for delivery to other countries by email: info@mybabygift.com.sg to confirm delivery costs to countries which aren’t on our list & estimated delivery time.